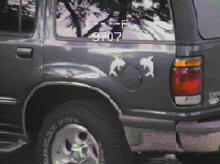 Vinyl Etchings decorative decals. 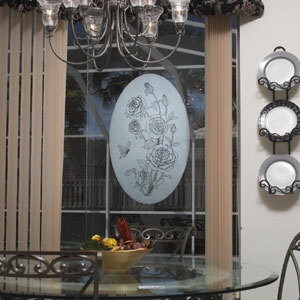 The look of real etched glass for less! 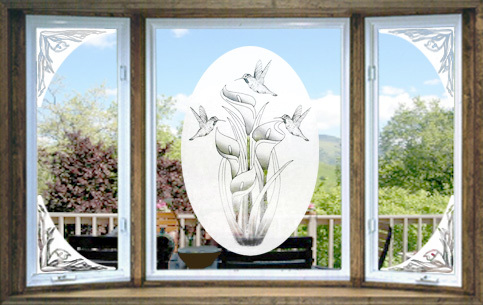 We manufacture Vinyl Etchings - Etched Glass Decals and Screen Art Magnets. Click the "Locate a Dealer"
Vinyl Etched Decals are static cling decals that adhere quickly and easily to glass doors, windows, mirrors, etc. 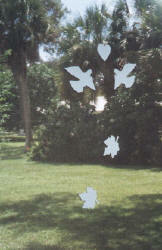 Screen Art Magnets are double-sided magnets used on screen windows & doors. Available in black, white and air-brushed colors. Quality products at affordable prices!!! To view wholesale prices and all requirements, please click here > "How to Order"
for our password to the wholesale order page Must send required info for password. Vinyl Etchings - Etched Glass Decals are non-adhesive, static cling, vinyl decals that have the look of real etched glass for a fraction of the cost! These elegant decals are removable and reusable. They are easy to use and apply quickly to any shiny, smooth glass or plastic surface. Link to instructions are on the Decal page. Apply them to mirrors, sliding glass patio doors, windows, entrance doors, shower doors, RV's, boats, etc. Click above on "Decals" for a look at all of our designs and sizes available. 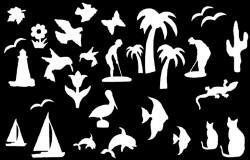 Screen Art Magnets are double sided, flexible, die-cut magnets to be used on window or door screens. Initially made for safety to keep children and pets from walking through screen doors but now are also known for hiding that hole or creating fun scenes. Regular magnet use on metal surfaces work as well. They come in various shapes and sizes. Colors are black, white or air-brushed! Click on "Magnets" above. Below are some illustrations/ideas on uses for our merchandise. Below are a few illustrations on uses for our merchandise. You can create your own beautiful scenes using each of these products. Check our Illustrations page for more ideas. The only limitation is your imagination! Roll mouse over pictures below to view another picture. Roll mouse over pictures below for another view. To purchase retail click the "Locate a Dealer" button at the top. Thank you for browsing, and please email us if you have any questions. 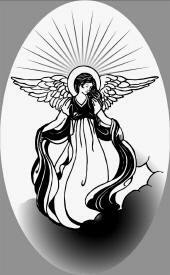 and pictures have been registered and are the sole property of Vinyl Etchings Int'l, LLC. Thank you.